A bizarre movie with dark characters. This is simply the best of Kubrick. 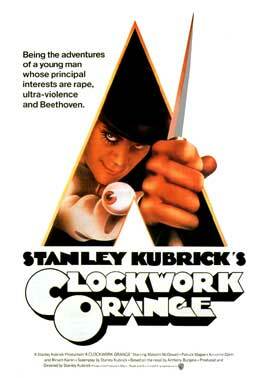 The main protagonist, Alex DeLarge (awesomely played of Malcolm McDowell), is a spiritual entity moving towards Darkness (violence, no regrets for wrongdoings, cruelty and control of the gang members). At the certain point, Alex becomes extremely dangerous and an uptight society is pushed to isolate him by the sending the young man to prison. A copy of the New Testament, which was giving to Alex to become a better person, attracts him only from a Dark character point of view – there is no compassion for Jesus, but an enjoyment of the cruelty of a Roman solder beating Jesus. Prison is not the best place for Alex and he takes advantage of a chance offered from the government to get out of prison – to go through a experiment. A priest pitches an idea of giving Alex his own (Spiritual) choice (towards Light), as a true cure for the young man (and society), but nobody is interested in it. (as a matter of fact, the “no-choice“ is a feature of Darks) . After the cure, Alex gets his freedom, but negative karma for all his bad doings acts against him and demands to pay back – so he suffers. The ending of the movie provides a new twist of survival for the protagonist. Alex gets help from a representative of the highest society, who offers him a mutually beneficial deal. The evolution of Alex towards Darkness continues on a new level.